I don’t eat very much pasta, but when I do it’s usually a classic spaghetti bolognese. 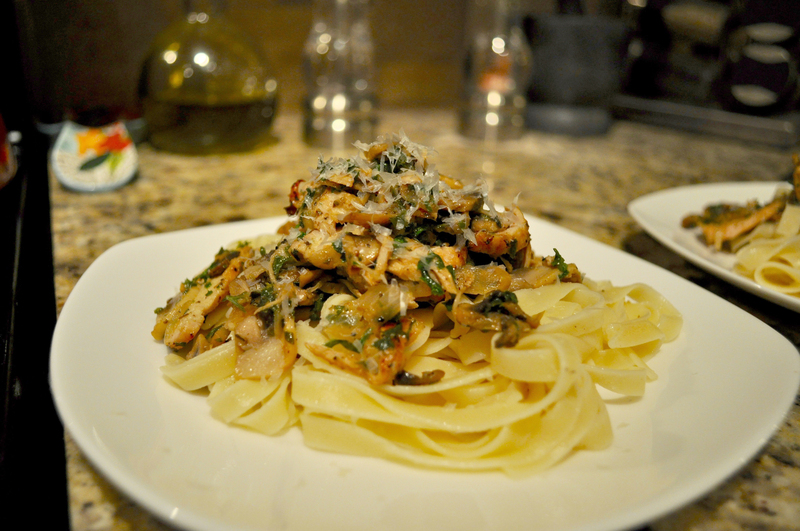 This time around, my husband and I decided to make this healthy chicken pasta dish for dinner. It was strangely windy in the South Bay last week so we felt like having comfort food, but did want the heavy after-feeling. Using just a few ingredients from the fridge, we cooked up a simple, lite, and relatively quick dinner. We try to eat as much as we can at home, and while I’d love to spend hours in the kitchen cooking up a storm, it just doesn’t work with our schedules. 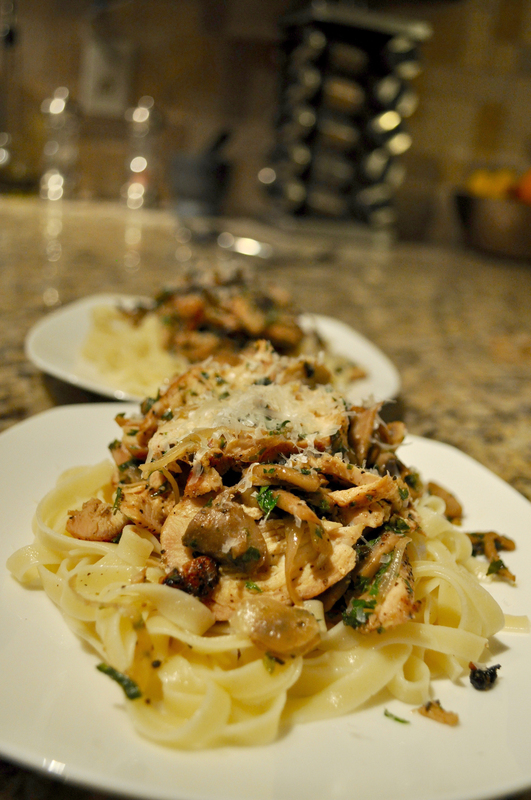 The good thing about pasta and chicken, is that you can create multiple different variations of this recipe. Grill chicken until fully cooked through, then set aside and cover with foil. In a medium saucepan heat olive oil over medium high heat. Add the onions and mushrooms and cook until softened. Add the garlic and parsley and cook for 2 more minutes. While that is cooking away, boil some water with salt for the linguini. Chop the chicken into thin strips. Add the salt, pepper, lemon juice and stir to coat. Add the white wine and scrape up any brown bits that might have formed on the bottom of the pan. Add the butter to the pan and let it melt into the other ingredients. 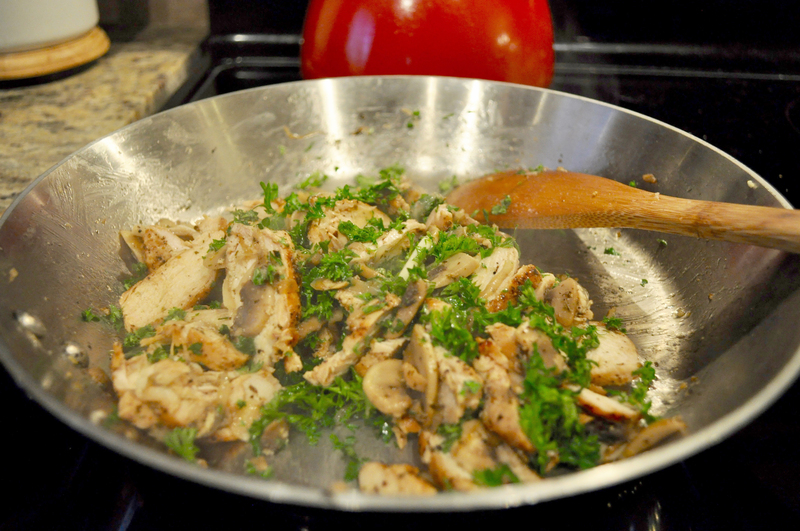 Stir in the chicken and linguini. Serve warm or cold with parmesan lightly grated on top. 1 Comment on "Healthy Chicken Pasta"
Yum! Looks super delicious!! And easy! Def need to try! !